U.S. Buildings steel metal buildings, commercial metal buildings and prefabricated commercial steel buildings are designed with durability and flexibility to meet any requirement. 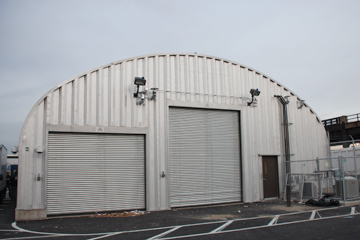 Our metal buildings are designed to withstand hurricane force winds along with other harsh weather elements, so your commercial space will be protected no matter what. For an office space that your business can easily afford, U.S. Buildings has the perfect solution. Our metal buildings can provide you with vast amounts of open floor space for cubicles, storage or conference rooms. Our steel buildings are also perfect for shipping facilities and distribution warehouses. You won’t find more affordable pricing on a steel metal building anywhere else in America. Our products are made right here at our factory in Boone, North Carolina with precision standards on a fully automated and computer aided manufacturing line. We’ve been in business for over 30 years and we pride ourselves in manufacturing our metal buildings from the finest heavy grade commercial steel available in the world. You can rest easy with your purchase knowing that our metal buildings have been thoroughly tested in independent labs and come from an American company that stands for quality, value and excellence in the industry. Why Choose Steel Commercial Buildings from U.S Buildings? Call U.S. Buildings now toll-free at 800-222-6335 to speak with one of our commercial steel building specialists. Be sure to ask about our money saving building specials that could save you up to 60% off your steel structure. You give us the specifics of your building projects and we’ll provide you with great options, a competitive price and a building that you’ll be proud to show off. Call us now!